Former Triple J Unearthed winner Thelma Plum stole hearts all around the country last year with her debut EP Rosie, and now she is back bigger and better with her follow-up EP Monsters. Only being 19 years of age, it’s hard to believe that she is the creator of this mature and well-crafted release. 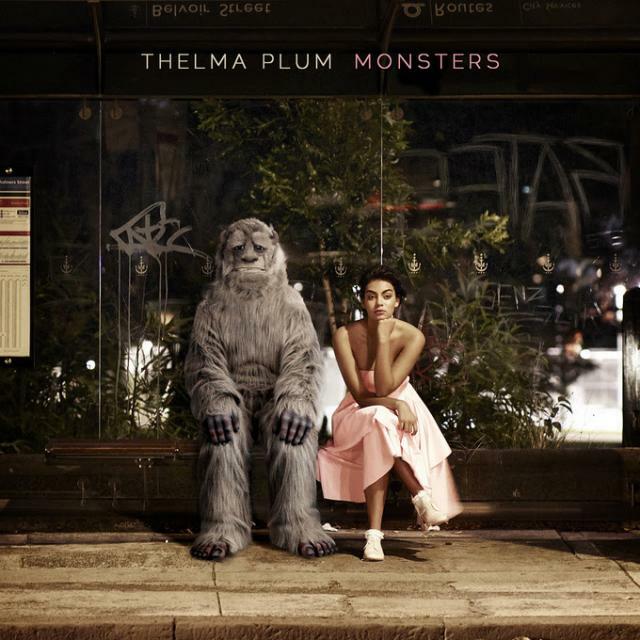 Rosie was complete with youthful cute melodies and catchy hooks, however Thelma Plum has thrown away her acoustic guitar and has embraced a full band giving her a much bigger sound on Monsters. Monsters is more emotional, mature and demonstrates Thelma’s accelerated transition from the challenging teens to adulthood. It’s evident Thelma has applied herself to expanding her creative potential by developing her vocals giving them more depth and using a broader range of instruments, and embracing electronic beats to support her emotional storytelling. “Monsters” is a stunning opening track, giving the listener access to her vulnerabilities, accentuated by her honest lyrics and the delicate string arrangements. “Young Love” is an emotional tale of dealing with change, with lyrics ‘Just a boy with a knife, you were stabbing right at my heart’ striking the listener hard. “How Much Does Your Love Cost” is the EP’s first single and you can instantly understand why. It’s got catchy hooks, electric rifts and a swooning melody that is complimented by a fun upbeat string arrangement. It’s a song that borders overstepping the appropriate amount of nostalgic pop, but Thelma somehow holds back enough to make it audibly pleasing. It’s high energy, a lot of fun and hell it makes me want to hum along. “Candles”, a song about a devastating heartbreak, concludes the record in spectacular emotional fashion. Thelma’s ability to relate and connect with people’s emotions is truly remarkable. Her soul-wrenching honesty transpires through her lyrics; ‘I’ve never hated myself more than yesterday, I never wished so hard that you’d just move away, I wish you were a candle burning on my shelf, then I could blow you out so you would hurt nobody else, yesterday was a mistake and I now feel like I am dying’. There is no hiding in this song, nor the rest of the record. Thelma’s storytelling is deep, thought provoking and at times induces a heartbreaking listening experience. Monsters is a stunning followup to her debut, that demonstrates her maturing as an artist as she stretches herself artistically to create something very different to her previous work. The only down side of this record is that it’s only 15 minutes long because honestly, I wanted to hear plenty more of where that came from. Let’s hope we don’t have to wait much longer for her debut album because there is no doubt it will be a delightful treat. Review Score: 8.6 out of 10. Tags: albumreview, aussiemusic, australianmusic, ep, livemusic, Music, review, thelmaplum. Bookmark the permalink. Previous post ← Feature: Top 5 albums of 2014 so far.